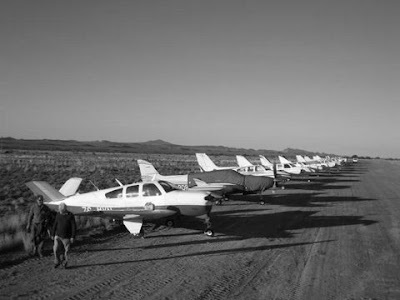 Prince Albert locals had their own air show recently when National Airways Corporation (NAC) organised a weekend fly-away to our beautiful town for 80 of their clients. Eighteen planes, Beechcraft Bonanzas and Beechcraft Barons, landed on the town’s air strip on Saturday morning, 18 July – luckily not all at once! One larger Beechcraft Baron, flown by Chris Briers (not our local dominee! ), did a spectacular low fly-past and later landed on Bergwater Wine Estate’s gravel runway. The fly-away was a surprise destination and treat for NAC’s clients, organized by the company’s marketing team, Tracy Porter, Tanya Krause, Denys Potgieter and JP Fourie. The visitors stayed at the Swartberg Hotel and at guesthouses in Prince Albert. The event was also in aid of charity and a wine auction was held to raise funds, as well as sponsor a hearty lunch prepared by the Swartberg Arms for all the residents of Huis Kweekvallei. The owners of the Beechcraft planes and NAC were very generous with the bidding and a five litre Bergwater Merlot Reserve was sold for R12! Bergwater’s Heimie Schoeman, who is a pilot himself, co-ordinated the weekend and arranged for the guests to be wined and dined on Saturday evening at the Bergwater wine cellar where our own singer/songwriter celeb, Brian Finch, provided the entertainment. Lienkie Koorts, together with her able team of friends and family, saw to the delicious snacks, buffet catering and stylish decorating of the candle-lit tables. These were set in between the huge stainless steel wine tanks, much to the delight and astonishment of the guests. After a hearty hotel breakfast the next morning, the aviators left in a whirl of engines and dust - taking with them delectable memories of this remarkable town and all it has to offer. Prince Albert’s Hennis Swanepoel too will have his own story to tell his grandchildren one day about the weekend that the local air strip was abuzz with activity; and of how, on his own on a cold winter’s night, he stayed awake next to a wood fire and kept an eye on millions of Rands’ worth of aircraft.